Dominicans watched history in the making last week when the United States of America's President Barack Obama and his entourage, that included his family, landed at Jose Marti Airport in Havana, Cuba, on March 20, 2016. For older Dominicans who experienced the six- decade-long tension between the US and Cuba, the images must have had special significance. Dominicans are concerned about the future of Cuba because that northern Caribbean nation has been a faithful friend for decades, even during the period when the Cold War was at its warmest, when Dominica's Prime Minister Dame Mary Eugenia Charles played a significant part in legitimising the so called American "liberation" of Grenada. Even then Cuba's assistance to Dominica's human resource development, especially in education and medicine in particular, did not falter. So, Cuba has been a dear friend to Dominica, through thick and thin, thorough out all administrations since political independence. But the distrust between Cuba and America is not expected to end anytime soon. Indeed no bobo that has been festering for more than half a century can be expected to be healed overnight. Undoubtedly, the US embargo on trade and finance against Cuba has severely wounded the Cuban people, not just Fidel and Raul. The embargo has been counterproductive and Obama is right: if Cuba is to embrace democracy any time soon engagement, rather than animosity, has the best chance of success. So, Americans who oppose Obama's move must relax and give peace a chance-the cold war has failed miserably. But the Cuban government is not about to give up its sovereignty in exchange for normalisation with the United States and frankly the Obama administration has not been requesting anything close to that. 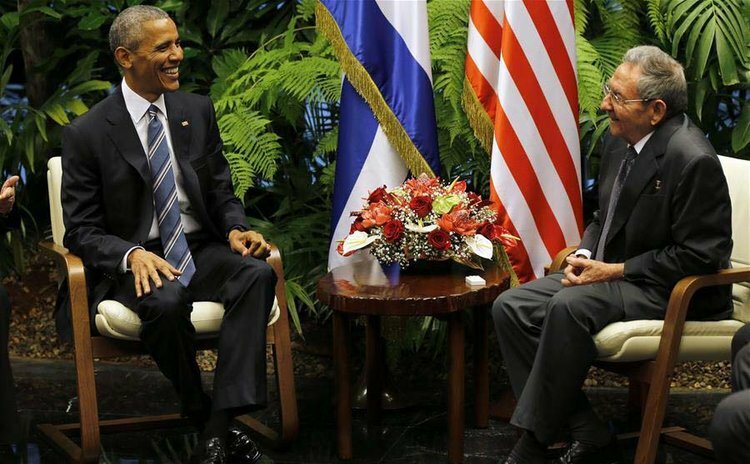 Nevertheless, Cuban President Rahul Castro felt it was necessary to remind Obama of Cuba's fifty years of defiance. "We will not renounce our ideals of independence and social justice, or surrender even a single one of our principles, or concede a millimetre in the defence of our national sovereignty. We will not allow ourselves to be pressured in regard to our internal affairs. We have won this sovereign right with great sacrifices and at the cost of great risks," Castro told Obama at a press conference during the visit. But Raul was preaching to the converted. Nevertheless, many Cubans have not accepted Obama's historic decision to normalise relations with Cuba; also a large number of Americans especially the supporters of the Republican Party thinks Obama has done something terrible by going to Cuba. Note that Republican candidates in the current race for Obama's position have all vowed to cancel all the changes that Obama has made to the status quo in US-Cuba relations. So expect a complete relapse in Cuba- US relations if the Republicans win the White House. In fact Ted Cruz has foolishly accused Obama of going to Cuba to hang out with fellow leftists and with Castro and his henchmen. "This is why it is so sad, and so injurious to our future as well as Cuba's, that Obama has chosen to legitimize the corrupt and oppressive Castro regime with his presence on the island," Cruz wrote in an article published in the Politico Magazine on March 20th 2016 entitled: "In Cuba Obama will legitimise the corrupt and ignore the oppressed- what's American about that?" In all of this belligerent attack on the US President one gets the impression that Republicans' opposition to the Cuban initiative is not about Cuba but about Obama. They hate the guy: everything he does seem to be bad for the nation. "But Republicans think that every last thing he does is wrong, and the only reason they can offer is that it's all weak, weak, weak, because much of it doesn't involve force or the threat of force. Yet as Obama said today in Cuba: "I know the history, but I refuse to be trapped by it." If you are not convinced that Republicans dislike Obama, read Cuban American Senator Marco Rubio ridiculous statement: "On Sunday, President Obama will touch down in Cuba for what promises to be one of the most disgraceful trips ever taken by a U.S. president anywhere in the world". But what do you expect from the current Republican Party? Last week Donald Trump continued to make a fool of himself and his party when he took issue with Obama because the US President did not insist that Cuban President Raul Castro meets him on the tarmac at Jose Marti when Air Force One landed there. Come on Donald! You of all people should know that every moment on such visits, every guest, and every nuance that can be predicted and planned would have to be sanctioned by the staff of the White House before Obama leaves America. Here in the Caribbean whenever there is discussion on the new era of "normalcy" between Cuba and the US, the issue of the impact on tourism inevitably emerges. Caribbean people know that soon airlines like American, JetBlue, and United and cruise ships will line up to take tourists to Cuba, if Cuba has the capacity to absorb the anticipated large influx curious Americans. Already travel between the United States and Cuba is up by more than 70%, in 2015. In fact the Caribbean Hotel and Tourism Association has begun preparing for the threat. The CHTA sees Cuba's opening to U.S. visitors as "the biggest and most disruptive pebble to be dropped into the Caribbean" since the U.S. embargo of 50 years ago.